New Footnote 2015: Over the years there have been small changes in the Pacific HH820. In the latest 2015 model I have found that the chain is just a tad too long and it is best to remove a half section of the end chain link. I do that by cutting the chain plate with a sawzall. That allows me to remove just that half link. Then in order for the new link to fit under the clamp I grind the end of the link enough so it's width will fit under the clamp and slip just far enough into the slot in the Roland pedal so you can attach the clamp. I also drill/expand the bolt hole in the clamp about 1/4" ovaled back so the bolt will fit easily in the clamp. Here is the Picture Folder I have found the Roland FD-7 HH controller/pedal to be excellent for these stand conversions. After comparing many stands I found the PDP HH820 to be simply ideal. The base of the stand is wide enough with modification to fit with the parts and housing of the FD pedal. The stand is a 2 leg stand with rotating legs, and it is very economical... sweet little stand. Even the chain bracket and bolt fits perfect with the FD-7 pedal and the bolt thread is identical to the bolts of the FD-7. So we start with a great match up: PDP HH820 and Roland FD-7. What you Need: The HH820 stand, the Roland FD-7 Pedal Controller, 2 ea. 8-32 X 1 1/4" pan head machine bolts, 2 ea. 8-32 hex nuts, 2 ea #8 flat washers, and 2 ea. #8 lock washers. Tools: Battery operated reciprical saw or just a hacksaw, battery operated drill and 3/16" metal drill bit, Allen wrenches, screwdrivers and pliers. The pictures are numbered for the construction of this stand.I will give an explaination of the build following the order. The chain attachment bracket is a perfect fit even the bolt is usable in the FD pedal attachment. Turn the FD pedal upside down and remove the screws holding the plastic housing. But hold the plastic housing together when removing the last screw. There are a couple tabs holding the plastic casing to the metal base, gently pop those through. Slowly swing the housing up like in the picture. There is a sensor strip that just slides into a slot. If you are careful you will be able to see how it attaches. If it slips out before you notice you can see in my pictures where it connects. It is an easy connection. It just plugs/slides in. Cut the base of the PDP stand. You will be removing enough so the base will fit neatly inside the housing of the FD-7. The holes for the carpet spikes of the PDP will be used to bolt the stand to the FD-7 plate. I now cut an additional portion of the base so that it will not contact the sensor strip. I used an Batter operated 18 Volt Ryobi SawzAll for the cutting. Place the stand and plate together, check the fit. When satisfied, hold the base in place and mark the holes for attaching FD plate to stand. You can scratch a mark on the plate by screwing the spikes down to mark the plate, or just use a nail to scratch a mark. Drill the 2 holes for stand attachment. I drilled 3/16" holes and used 8-32 X 1 1/4" machine bolts, #8 flat and #8 lock washers, I used wing nuts only because that is what I already had, but 8-32 nuts or lock-nuts will do fine. Place the machine screws through the bottom plate. You can cut a little hole in the rubber of the plate to allow the head of the bolt to flush up to the metal plate. Place the stand base over the machine bolts and fasten the stand down. The stand is now fastened to the plate. Side view of the same. Cut out the 2 corners of the FD plastic housing. Cut just barely more than you need to to make for an easy fit. The picture shows the plastic housing in place after I had cut out the 2 corners. An easy way to do this is to cut a the 2 areas out but don't go too big... then check it ... cut a little more if needed. Another view of the housing cut outs. Reattach the plastic housing being sure your sensor strip is plugged in before closing. 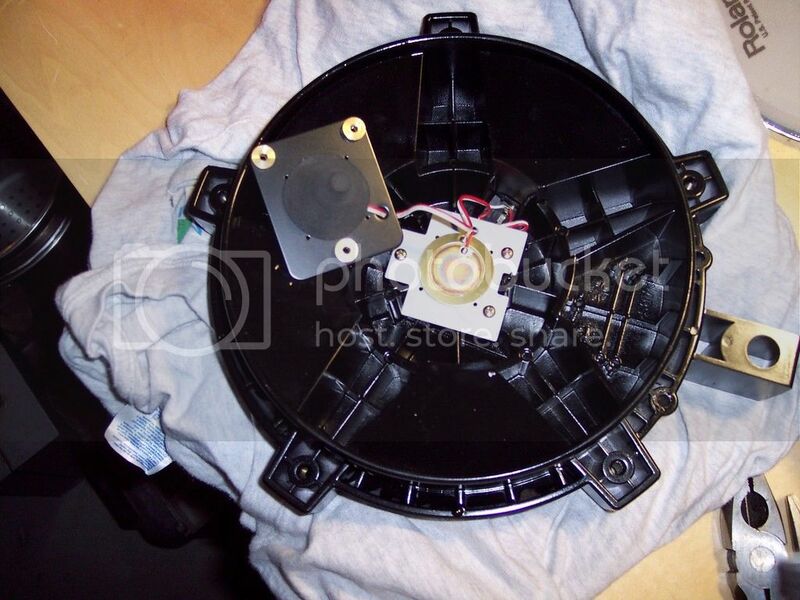 Put the plunger and slide bracket back inside the plastic housing. Put the pedal spring back in place. The pedal must go on top of the black bracket. Attach the pedal to the bracket from underneath using 2 of the Allen screws. Attach the chain and chain bracket using the remaining Allen bolt. See these attached pics from many years ago (note the date). a place on the jack board for the piezo wires. A fairly simple mod to make that PD-80 Dual Zone. This is my latest wrapped drumsticks. I find grip wrapped drumsticks preferable to dipsticks. I've tried different variations, and the dipsticks peal pretty quickly for me, even when I dip my own. I also find the Wrapsticks eliminate much of the harmful vibrations.